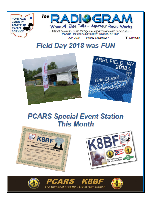 Greetings PCARS Members, ARRL Officials, Amateur Radio Clubs and other interested people,The July issue of The RADIOGRAM has been published and is ready for you to enjoy. Click on the PDF icon or click the NEWSLETTER tab on the PCARS web site and you can either view the newsletter on-line, or right click and ‘save-as’, then put it on your computer to view off-line. Hope you enjoy this issue – READ ALL ABOUT IT – Field Day was FUN – Tesla vs Ediison – PCARS Special Event Station information – New Tech Class Question Pool – Ham Radio Heroes – PCARS has a TON of stuff going on and even more in the works – something for everyone! PCARS July Newsletter is here ! The July issue of The RADIOGRAM has been published and is ready for you to enjoy. Some of you might be interested in Summits On The Air Activations. I received this from KN4BBC – Alan Lambert. I’ll be attempting the follow summits July 4-8. This is a work in progress and may change. Looking for inputs for the July Newsletter. Last Friday of the month is coming up fast (June 29th). Please get your inputs in as soon as possible. Got a Field Day Story? Send it in. Also send me your Field Day pictures, too !!! It's time for me to move on and let someone else stand in as the PCARS Secretary. Over this past 18 months I've been able to get a pretty good idea of all the responsibilities the secretary has and how they are best taken care of. I am willing to help and assist a new secretary during a transition period. The club secretary is a very important position and it needs a person who will be committed to being involved in everything the club is doing! But, that involvement will be rewarding in many ways: you will be a part of everything going on, you will get to know ALL of your fellow PCARS members on a much different level, and everyone will know who you are! Please consider being a part of the PCARS leadership team that will take the club through it's next level of achievement and growth. The position is appointed by the president, so you will not need a ballot confirmation to be appointed to the position. If you have interest in serving this way, please contact Jim – AC8NT. If you want to talk about what all is involved, please contact me and I'll go over it all with you. are several things you need to do to get ready. • Make sure you have installed WSJT-X v1.9.1 on your computer. checking that box on the “Advanced” tab under WSJT-X File/Settings. • Make your initial call as a Hound in the range of 1000 – 4000 Hz. • Remember to uncheck “Hound” when you return to normal FT8 operations. WSJT-X program. This only takes a few minutes to do. where you will find the list of FT8 frequencies the DXpedition will be using. • Now go to File/Settings in WSJT-X and click on the "Frequencies"
of the mode list), then insert the first frequency "3.567" and click "OK"
and repeat until all have been entered. This Thursday – June 28. Doors open at about 6:30 and close whenever we are done with the movie for the evening: Dr. Strangelove, or, How I stopped worrying and learned to love the bomb. Come on out and check into the PCARS Net from the club site station. We'll have some snacks and beverages and plenty of time to compare Field Day notes and stories. First, Thanks to all those who volunteered. With 15 volunteers we have a full crew ready to go and I am sure that we will get all the antennas up and operational in record time. Everyone please meet at the picnic shelter just before 10:00 for a very brief meeting. Below is a basic outline of what we are going to do along with some notes on safety. See you all there Saturday and Thanks Again! The Basic Work Plan: The Antenna Crew needs to show up at the FD Site by 10:00am and meet at the picnic shelter. Station captains will be on site with all the equipment and tools needed for their stations. The station captains know what we will need to erect and we will follow their instructions. I will divide the crew into teams and send them off to individual stations to help each statiton catptain erect their antenna system. Safety Equipment: Everyone must have safety glasses (your own prescription shatter resistant glasses are okay); Gloves (have them with you); A hard hat (there will be hardware tens of feet above your heads, and a bolt falling from 30 feet will ruin your day if it hits you! ); Steel toe bohots are never a bad idea if you have them. YOUR BEST Safety Equipment is between your ears, stay alert and think ahead. AND you should bring rain gear and insect repellant. State Route 700 is being repaved. From my information due to weather and weekend time frame the won't be doing any actual paving but be aware that the road bed has been ground and pavement has grooves from grinding. PLEASE use caution while driving on this pavement as it can cause some instability while driving. Final Flex Station schedule is attached. PLEASE let me know if you want to operate or log and we'll fit you in!! Thanks ! !